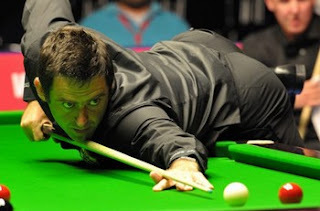 On the first day of PTC4 (Paul Hunter Classic), Ronnie O'Sullivan scored his eleventh maximum break in the Last 32 match against Adam Duffy in Germany. The Rocket created a new record for most 147s in career which surpassed Stephen Hendry and his own record for tenth maximum. O'Sullivan got 2000 pounds for the maximum under the new rolling 147 bonus system. O'Sullivan last 147 is made on World Open Last September while Hendry's is on this year's Welsh Open. Ronnie handed a superb performance today. He beaten Ali Kirim and Anthony McGill early on before the match with Adam Duffy. Ronnie tried 147 in the following frame after he made eleventh 147 successfully but missed the twelfth black at 89. Li Yan set up a Last 16 match with the Rocket as he beaten John Higgins. Jimmy White tried maximum at the afternoon but unfortunately missed the final yellow! Later Jimmy lost to Mark Davis in Round 4. Mark Davis successfully entered top 16 of world rankings and Last 16 of PTC4. Well done Mark! Judd Trump was defeated by Andrew Higginson 3-4. Mark Selby headed to Last 16 without losing a frame and knocked breaks of 119, 76 and 70. Stephen Lee is also a member of Last 16 on Sunday.